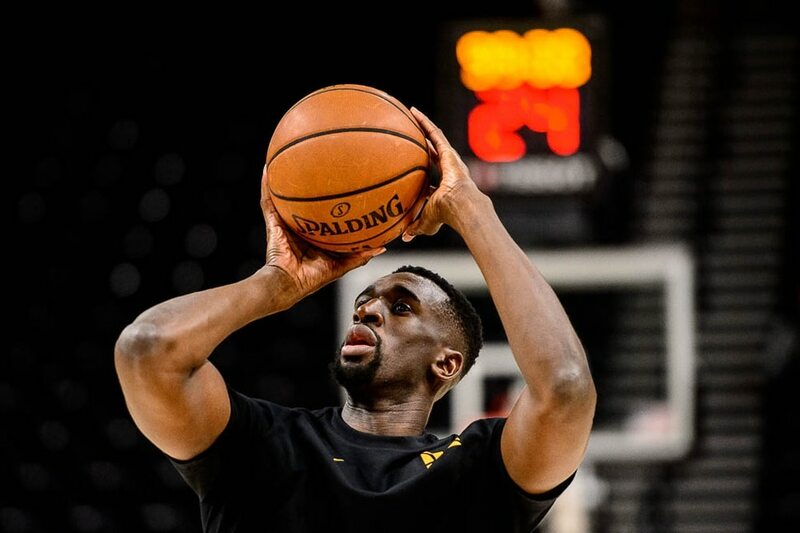 (Trent Nelson | The Salt Lake Tribune) Utah Jazz center Ekpe Udoh (33). Utah Jazz vs. Boston Celtics, NBA basketball in Salt Lake City on Friday Nov. 9, 2018. (Trent Nelson | The Salt Lake Tribune) Boston Celtics forward Gordon Hayward (20) and Utah Jazz forward Joe Ingles (2). Utah Jazz vs. Boston Celtics, NBA basketball in Salt Lake City on Friday Nov. 9, 2018. 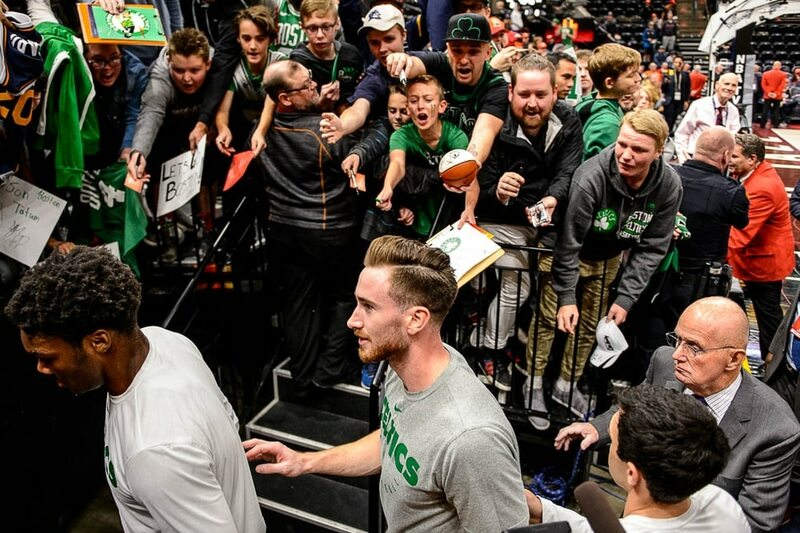 (Trent Nelson | The Salt Lake Tribune) Boston Celtics forward Gordon Hayward (20) walks past fans after a pre-game warmup. Utah Jazz vs. Boston Celtics, NBA basketball in Salt Lake City on Friday Nov. 9, 2018. (Trent Nelson | The Salt Lake Tribune) Utah Jazz guard Donovan Mitchell (45). Utah Jazz vs. Boston Celtics, NBA basketball in Salt Lake City on Friday Nov. 9, 2018. (Trent Nelson | The Salt Lake Tribune) Utah Jazz guard Ricky Rubio (3). Utah Jazz vs. Boston Celtics, NBA basketball in Salt Lake City on Friday Nov. 9, 2018. (Trent Nelson | The Salt Lake Tribune) Utah Jazz guard Donovan Mitchell (45) defended by Boston Celtics guard Marcus Smart (36). Utah Jazz vs. Boston Celtics, NBA basketball in Salt Lake City on Friday Nov. 9, 2018. (Trent Nelson | The Salt Lake Tribune) Utah Jazz forward Joe Ingles (2) wrapped up by Boston Celtics guard Marcus Smart (36). Utah Jazz vs. Boston Celtics, NBA basketball in Salt Lake City on Friday Nov. 9, 2018. (Trent Nelson | The Salt Lake Tribune) Utah Jazz guard Donovan Mitchell (45) defended by Boston Celtics guard Marcus Smart (36). Utah Jazz vs. Boston Celtics, NBA basketball in Salt Lake City on Friday Nov. 9, 2018. (Trent Nelson | The Salt Lake Tribune) Utah Jazz guard Donovan Mitchell (45) defended by Boston Celtics guard Marcus Smart (36). Utah Jazz vs. Boston Celtics, NBA basketball in Salt Lake City on Friday Nov. 9, 2018. (Trent Nelson | The Salt Lake Tribune) Utah Jazz guard Donovan Mitchell (45) defended by Boston Celtics guard Marcus Smart (36). Utah Jazz vs. Boston Celtics, NBA basketball in Salt Lake City on Friday Nov. 9, 2018. (Trent Nelson | The Salt Lake Tribune) Utah Jazz guard Donovan Mitchell (45). Utah Jazz vs. Boston Celtics, NBA basketball in Salt Lake City on Friday Nov. 9, 2018. (Trent Nelson | The Salt Lake Tribune) Utah Jazz guard Ricky Rubio (3). Utah Jazz vs. Boston Celtics, NBA basketball in Salt Lake City on Friday Nov. 9, 2018. (Trent Nelson | The Salt Lake Tribune) Utah Jazz forward Joe Ingles (2). Utah Jazz vs. Boston Celtics, NBA basketball in Salt Lake City on Friday Nov. 9, 2018. (Trent Nelson | The Salt Lake Tribune) Utah Jazz guard Ricky Rubio (3) defended by Boston Celtics center Aron Baynes (46). Utah Jazz vs. Boston Celtics, NBA basketball in Salt Lake City on Friday Nov. 9, 2018. (Trent Nelson | The Salt Lake Tribune) Utah Jazz guard Ricky Rubio (3). Utah Jazz vs. Boston Celtics, NBA basketball in Salt Lake City on Friday Nov. 9, 2018. (Trent Nelson | The Salt Lake Tribune) Boston Celtics guard Marcus Smart (36) defended by Utah Jazz guard Dante Exum (11). Utah Jazz vs. Boston Celtics, NBA basketball in Salt Lake City on Friday Nov. 9, 2018. (Trent Nelson | The Salt Lake Tribune) Utah Jazz guard Donovan Mitchell (45). Utah Jazz vs. Boston Celtics, NBA basketball in Salt Lake City on Friday Nov. 9, 2018. (Trent Nelson | The Salt Lake Tribune) Utah Jazz forward Jae Crowder (99) celebrates a three-point shot. Utah Jazz vs. Boston Celtics, NBA basketball in Salt Lake City on Friday Nov. 9, 2018. (Trent Nelson | The Salt Lake Tribune) Utah Jazz guard Donovan Mitchell (45). Utah Jazz vs. Boston Celtics, NBA basketball in Salt Lake City on Friday Nov. 9, 2018. (Trent Nelson | The Salt Lake Tribune) Boston coach Brad Stevens. Utah Jazz vs. Boston Celtics, NBA basketball in Salt Lake City on Friday Nov. 9, 2018. (Trent Nelson | The Salt Lake Tribune) Utah Jazz vs. Boston Celtics, NBA basketball in Salt Lake City on Friday Nov. 9, 2018. (Trent Nelson | The Salt Lake Tribune) Utah Jazz guard Ricky Rubio (3) defended by Boston Celtics center Al Horford (42). Utah Jazz vs. Boston Celtics, NBA basketball in Salt Lake City on Friday Nov. 9, 2018. (Trent Nelson | The Salt Lake Tribune) Utah Jazz forward Joe Ingles (2) wrapped up by Boston Celtics guard Marcus Smart (36). Utah Jazz vs. Boston Celtics, NBA basketball in Salt Lake City on Friday Nov. 9, 2018. (Trent Nelson | The Salt Lake Tribune) Utah Jazz forward Joe Ingles (2) defending Boston Celtics guard Marcus Smart (36). Utah Jazz vs. Boston Celtics, NBA basketball in Salt Lake City on Friday Nov. 9, 2018. (Trent Nelson | The Salt Lake Tribune) Boston Celtics forward Gordon Hayward (20) on the bench in the first quarter. Utah Jazz vs. Boston Celtics, NBA basketball in Salt Lake City on Friday Nov. 9, 2018. (Trent Nelson | The Salt Lake Tribune) A Utah fan wearing an altered Gordon Hayward jersey. Utah Jazz vs. Boston Celtics, NBA basketball in Salt Lake City on Friday Nov. 9, 2018. (Trent Nelson | The Salt Lake Tribune) Boston Celtics forward Gordon Hayward (20). Utah Jazz vs. Boston Celtics, NBA basketball in Salt Lake City on Friday Nov. 9, 2018. (Trent Nelson | The Salt Lake Tribune) Utah Jazz center Rudy Gobert (27) and Utah Jazz forward Derrick Favors (15) during player introductions. Utah Jazz vs. Boston Celtics, NBA basketball in Salt Lake City on Friday Nov. 9, 2018. (Trent Nelson | The Salt Lake Tribune) Utah Jazz guard Donovan Mitchell (45). Utah Jazz vs. Boston Celtics, NBA basketball in Salt Lake City on Friday Nov. 9, 2018. (Trent Nelson | The Salt Lake Tribune) Utah Jazz guard Ricky Rubio (3) shoots with Boston Celtics forward Gordon Hayward (20) defending. Utah Jazz vs. Boston Celtics, NBA basketball in Salt Lake City on Friday Nov. 9, 2018. (Trent Nelson | The Salt Lake Tribune) Boston Celtics forward Gordon Hayward (20) picks up a foul. Utah Jazz vs. Boston Celtics, NBA basketball in Salt Lake City on Friday Nov. 9, 2018. (Trent Nelson | The Salt Lake Tribune) Boston Celtics guard Terry Rozier (12) defended by Utah Jazz center Rudy Gobert (27) and Utah Jazz guard Donovan Mitchell (45). Utah Jazz vs. Boston Celtics, NBA basketball in Salt Lake City on Friday Nov. 9, 2018. (Trent Nelson | The Salt Lake Tribune) Utah Jazz forward Jae Crowder (99) celebrates a dunk. Utah Jazz vs. Boston Celtics, NBA basketball in Salt Lake City on Friday Nov. 9, 2018. (Trent Nelson | The Salt Lake Tribune) Boston Celtics forward Gordon Hayward (20) defended by Utah Jazz guard Donovan Mitchell (45). Utah Jazz vs. Boston Celtics, NBA basketball in Salt Lake City on Friday Nov. 9, 2018. (Trent Nelson | The Salt Lake Tribune) Boston Celtics forward Gordon Hayward (20) defended by Utah Jazz guard Donovan Mitchell (45). Utah Jazz vs. Boston Celtics, NBA basketball in Salt Lake City on Friday Nov. 9, 2018. (Trent Nelson | The Salt Lake Tribune) Utah Jazz forward Jae Crowder (99) has words for Boston Celtics forward Marcus Morris (13). Utah Jazz vs. Boston Celtics, NBA basketball in Salt Lake City on Friday Nov. 9, 2018. (Trent Nelson | The Salt Lake Tribune) Utah Jazz center Rudy Gobert (27) looks to pass. Utah Jazz vs. Boston Celtics, NBA basketball in Salt Lake City on Friday Nov. 9, 2018. (Trent Nelson | The Salt Lake Tribune) Boston Celtics forward Gordon Hayward (20) is fouled by Utah Jazz forward Joe Ingles (2). Utah Jazz vs. Boston Celtics, NBA basketball in Salt Lake City on Friday Nov. 9, 2018. (Trent Nelson | The Salt Lake Tribune) Utah Jazz center Rudy Gobert (27) pulls down a rebound. Utah Jazz vs. Boston Celtics, NBA basketball in Salt Lake City on Friday Nov. 9, 2018. (Trent Nelson | The Salt Lake Tribune) Boston Celtics guard Marcus Smart (36) defended by Utah Jazz guard Donovan Mitchell (45). Utah Jazz vs. Boston Celtics, NBA basketball in Salt Lake City on Friday Nov. 9, 2018. (Trent Nelson | The Salt Lake Tribune) Boston Celtics forward Gordon Hayward (20) is fouled by Utah Jazz forward Joe Ingles (2). Utah Jazz vs. Boston Celtics, NBA basketball in Salt Lake City on Friday Nov. 9, 2018. (Trent Nelson | The Salt Lake Tribune) Boston Celtics forward Gordon Hayward (20). Utah Jazz vs. Boston Celtics, NBA basketball in Salt Lake City on Friday Nov. 9, 2018. (Trent Nelson | The Salt Lake Tribune) Boston Celtics forward Gordon Hayward (20) defended by Utah Jazz guard Donovan Mitchell (45). Utah Jazz vs. Boston Celtics, NBA basketball in Salt Lake City on Friday Nov. 9, 2018. (Trent Nelson | The Salt Lake Tribune) Utah Jazz guard Donovan Mitchell (45). Utah Jazz vs. Boston Celtics, NBA basketball in Salt Lake City on Friday Nov. 9, 2018. The media attention he wanted in Boston could be found here in Utah, it turned out. He just had to leave to get it. Hayward’s on-court time was limited thanks to his recovery, but he did play 26 minutes. In that time, he scored 13 points, though shot just 3 of 9 from the field. He acted as a facilitator for the Celtics offense and added seven assists. Defensively, though, he struggled to keep pace with the Jazz’s Donovan Mitchell: The Jazz chose to switch Mitchell onto Hayward repeatedly, then attacked him with isolation situations. As In-arena announcer Dan Roberts announced Hayward’s name, Jazz fans responded with a cacaphony of boos, one not heard since Enes Kanter’s return to Utah after demanding a trade to Oklahoma City. Every time Hayward touched the ball, more boos rang out. The Jazz organization chose not to honor him with an in-game tribute video, knowing that would only continue the boos. Instead, they released a short, 20-second video online before the game, one that got its own quantity of negative feedback. There were signs too: “Gordon Who?” “Call Gail,” and even a collage of a dunking Mitchell pasted above an injured Hayward. 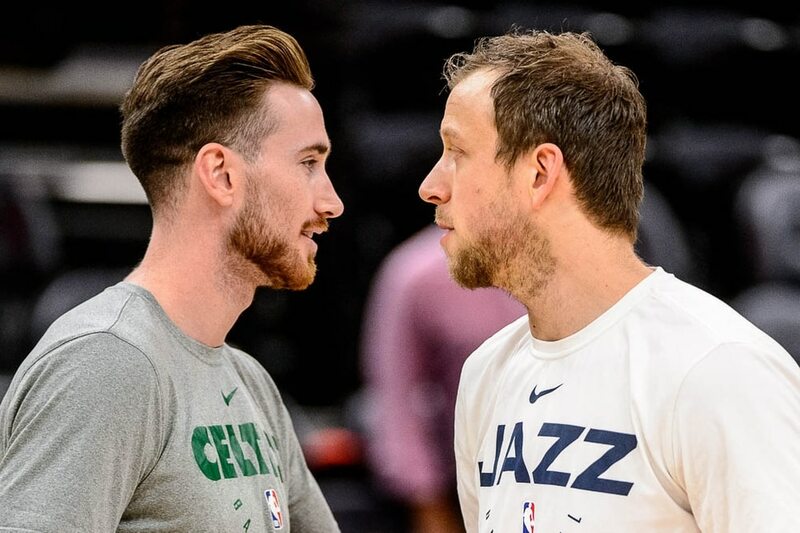 Those emotions came at their highest, Hayward said, when he met with those he knew best before the game: Joe Ingles came over and laughed with Hayward, as did Jazz general manager Dennis Lindsey. Hayward did decline to appear for a league-mandated media session before the game for reasons unknown, postponing the chance to face the media until after the contest. The former Jazz forward hasn’t had a superlative season, with averages of 9.9 points, 5.6 rebounds, 4.4 assists per contest in an injury-mandated 25 minutes per night. He’s clearly shaking off rust, trying to get old rhythm and mobility back. Friday night’s special contest was the first time he’d played a back-to-back this season, but he couldn’t pass up the chance to play again in the arena that he called home for seven years.